To ice or to heat, that is the question. Whether to heat or ice greatly depends on whether you are experiencing pain or stiffness and also if it is a new or chronic injury. Ice is great for new injuries, inflammation, and swelling as the tissue is usually strained and damaged. Inflammation is good as the body’s natural response to promote healing by applying cold to an injury it can reduce excessive swelling and numb acute pain. Heat is great for prolonged (or chronic) injuries as it increases blood flow to relieve stiffness, relaxes muscles and aching joints, opens up blood vessels, improves flexibility of tendons and ligaments and can help to reduce muscle spasm. It is best to heat after inflammation has resolved. It is important to allow the skin to return to normal temperature before reapplying ice or heat to avoid burns. Always employ a thin protective layer between skin and the ice or heat packas a preventative measure against burns. Try using a kitchen towel or pillowcase. It is not recommended to ice or heat while sleeping or in areas with decreased sensation as this increases the likelihood of burns. Set a timer! Ice for a minimum of 10 minutes and no more than 20 minutes at a time. Avoid cold burns! Cold burns can cause the reverse effect of icing when the body responds by trying to warm the area by increasing blood flow. It is recommended to ice periodically during the first 48 hours after acute injury. Physical therapists generally use ice to reduce inflammation after manual therapy or exercise. You can buy a variety of different ice, gel, and other over the counter products for icing, however, using a plastic zip bag with ice and some water is a good inexpensive alternative. Set a Timer! Heat is recommended for no more than 20 minute intervals. Heat is not recommended for patients who have had recent injuries or surgeries. At this stage, a patient would want to reduce inflammation and swelling. While the warmth might feel soothing, it can increase the inflammation. Tight muscles can be prone to injury. If there are no other precautions to exercise, the best method to “heat” an area is a thorough gentle stretching or systemic warm-up such as a brisk walk, light bike ride, or other light warm up. Physical Therapists also may use heat therapy before exercise routines or manual therapy to help reduce muscle tightness, improve pliability, and improve circulation. Electric heating pads, reusable gel packs, steamed towels, hot tubs, baths, and showers are great sources of gentle heating. The goal of heat therapy is to keep your heating pad warm enough to relax tight muscles, but not hot enough to burn the skin. Your body’s comfort and health can affect many aspects of your life. It is very important to address new injuries and chronic issues including pain as soon as possible. Ask your healthcare professional whether ice or heat is the best option for your condition even after your rehabilitation is complete. Godsey, MSN, APRN, MSHE, FNP-BC, C. (Ed.). (n.d.). 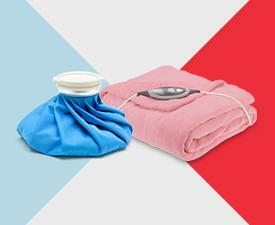 When to Use Hot and Cold Therapy. Retrieved August 31, 2015. Edited and Arranged by Julia Slater, B.A.